Moda Man and I arrived yesterday to a chilly and rainy Seattle..well the airport area..not sure just where Seattle is. Kathy arrived a few hours later and we are enjoying the Holiday Inn thank you Laurie...good to be friends and family. we are soon headed back to the airport to pick up the ground transportation to the pier. moda Man is quite excited about his latest adventure! North to Alaska, go west the rush is on! Well, first west and then north. Still have packing to do but I think I have things ready to pack. And the things I should have done last weekend? Didn't get done. 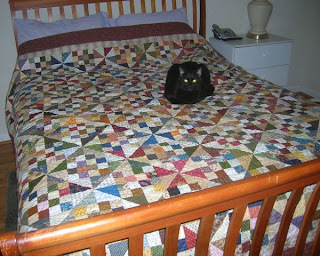 But the FQ mystery quilt is done but for the outer border. And I did take apart the "Moose" block that I messed up and fixed it. I knew it would bug me otherwise. 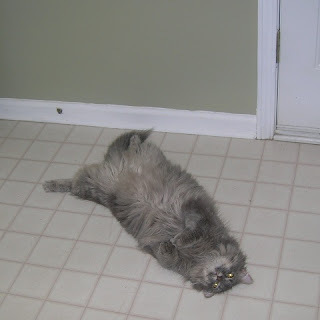 Laurie wrote on FB today that she saw the following sign on a car: "One Cat Away from being Crazy Cat Lady"
I think that is one great bumper sticker or magnet sign. I wish I knew where one was available! It makes me laugh! After seeing Gretch work on sashings for the mystery quilt from FQ Shop on Saturday, I decided I really should do it as well. After all, I lugged the whole mess to Elijay in February and I am not sure if the bag made it out of the car. So last night, I pulled it out of the sewing room and looked at it. That's all....just looked at it. This evening, I opened up the bag...baby steps... I have now made the first 2 stars in the center section. And now I am spent! I think it is going back in the bag for now. I looked at the one block I did on Saturday and messed up. And now I don't know if I want to fix it or not. Only I will know that it is wrong. But now it is beginning to bug me. I will probably end up unsewing the outer borders and redoing it. Later....much later....now the couch is calling! 7 days until vacation...5 work days.......WOOT WOOT WOOT!!!!!! I sort of feel that way. I had a great time at Thimbles on Saturday. Pat whipped me into shape. I finished 2 blocks..pix to follow. 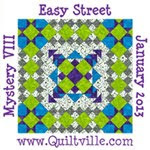 I watched Gretch work on the finishing kit for the FQ Shop mystery quilt. I really need to start cutting that one out. Sunday I went on a hunt for a sweatshirt for Alaska. It is pretty close to impossible to find a sweatshirt in Atlanta in May. I ended up with a $5 special from Walmart with a Ga Tech logo. Good enough. Other than Kathy, I will never see these people again. What do I care if they think I am a little nuts. Ask my girls, they will tell you I AM nuts! Also got binoculars. Started a packing list. Than I went to the couch-where I spent most of the weekend. Laurie suggested zyrtec and I got another cough medicine. They have really helped. I have an allergy to something. Maybe work????? Counting down the days...not counting today-it is 9 days until I leave for Seattle. I haven't told the boys that I am going on vacation. I know that they will not be happy! They ventured out on their first road trip to visit Bad Melisa. I had the need to fondle fabric after another quite crappy day at work. How long til I can retire???? It is a good thing that vacation is immanent because I am becoming less tolerant of many people I work with. At any rate Melisa had posted about new Moda Christmas lines in precuts arriving at the store. 1-800-GOTTA HAVE. 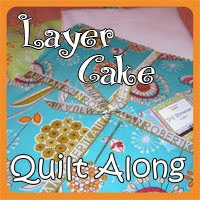 I came home and downloaded a pattern from the Bake Shop web site for the layer cake. I did not purchase one of the available lines-too vanilla. It just did not sing like the others. The new French General line is yummy much like Reenewzit. So now onto another day at the home TGIF. 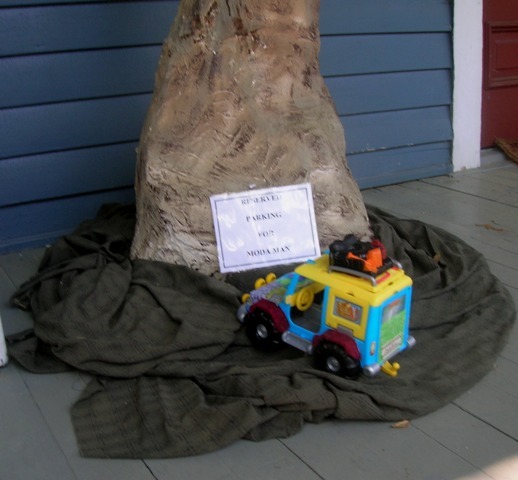 On top of all that happened there this week, one of my favorite residents died. She is in a better place but I will miss her. 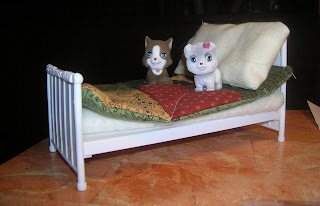 Tomorrow is Thimbles...yeah. I know Pat will perk me up! I tried to snap a picture of them but they were hiding under the bed! Moda Man could not say no to the second kitten-so he took both of them. Bolt is a little jealous. Moda Man had to make a trip out to Sweet Home today to put up his sign. He must have been inside negotiating with Melisa when the picture was snapped. Not sure where Bolt was! Melisa said that when the tree goes, he can have Mike's spot. But that is a pretty long walk for the guy...we will have to see! I roamed about the shop, while he was taking care of his business. I can't show what I got today as it is a birthday present for my friend Kathy. She is the one that I conned into going with me to Alaska..IN THREE WEEKS!!!!!!!! 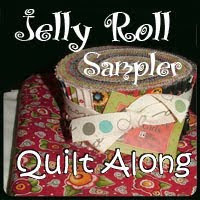 Also got the latest issue of Quilt Sampler magazine. I told Melisa that I needed to pick this up since she posted yesterday and Sweet Home is the only place it is available...other than every supermarket, book store, etc. Any excuse to go to Sweet Home will do! off to work on the project for Kathy. this morning I finished the binding on Patches and Pinwheels-the swap we did at Thimbles. This is one big quilt! I was able to finish the binding today as I am at home waiting for the garage door people to arrive. Don't you just hate waiting?? I thought I would make it to work today but at this rate, I doubt it! Guess i will go prowl around the sewing room for the next project! 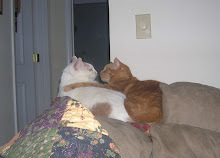 We got up early this morning...most likely because I slept most of the evening on the couch! I NEEDED to make a visit to Sweet Home since I had 2 books waiting for me there. I wanted to go all week but work got in the way. So now I have A Baker's Dozen (Patchwork Place) and Schnibbles Times Two. I hope I learn what a "schnibble" is. 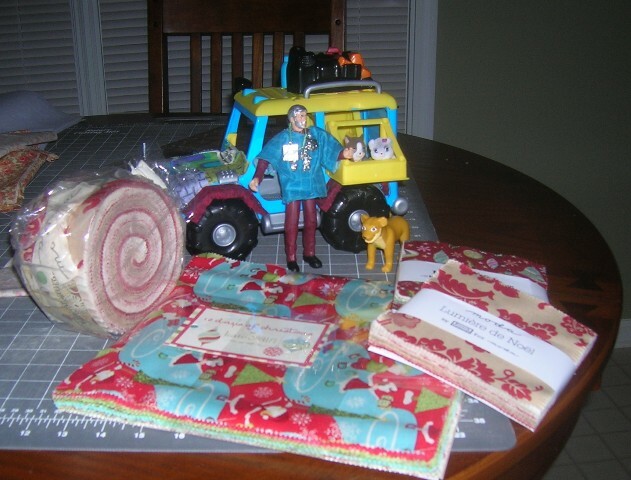 I was pretty good on fabric-only picked up 3 quarter yard pieces of a line by clothworks. I did run it by Moda Man and he was okay with it since I did not get that much. And then I saw this pretty kit all cut out and ready to sew. I already have the Take 5 pattern. (checked when I got home). The colors are so soft and pretty....like I need another thing to sew! Bolt was a good boy and did not do any barking. He just stayed close to Moda Man. He sat in his spot in the car. I now have the binding on Patches and Pinwheels-all 4 miles of it. Hoho, hiho-it is off to hand sewing I go!